Earlier this week, Nokia announced two new Symbian handsets, the X7 and the E6. Microsoft also had some news of its own, finally offering up details on its upcoming Mango update for the Windows Phone 7, which promises a slew of upgrades for the line. And now we’re getting a glimpse at what could be the first Nokia Windows Phone 7 devices. And Nokia won’t stop there. 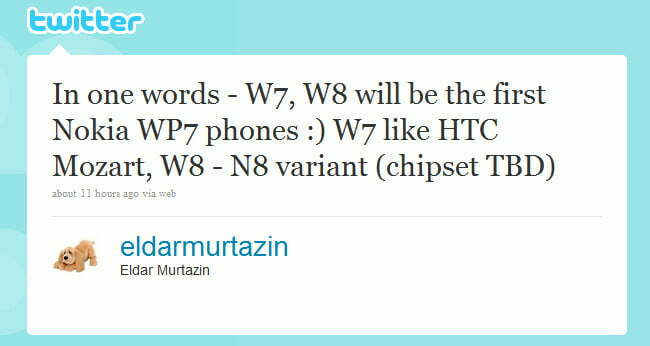 Apparently the company has a slew of WP7 handsets (12, according to Murtazin) planned for next year, including a more affordable model with a lower quality touchscreen. He also mentions that Symbian will die a slow death over the coming year. Production focus will, unsurprisingly, align with WP7 and he speculates that 6,000 Symbian developers will be leaving Nokia.